How Much Gold or Silver Is Really in Your Jewelry? Know what your jewelry is really worth! If you don’t buy jewelry often, you might not realize that there’s a discrepancy between the retail price of each item—i.e., what you pay at the store—and its intrinsic value. While precious metals command a pretty penny, all retailers mark up jewelry by a significant amount. They need to make a profit, so you can’t really blame them. To be an informed consumer, however, you need to know more about the intrinsic value of your pieces. Before we can have an informed discussion of intrinsic value, some understanding of the concept of spot pricing is necessary. Every precious metal has a value that fluctuates on a daily, hourly, and even minute-by-minute basis. Many factors contribute to these fluctuations, including global economic indicators, political considerations, and the technical maneuvering of folks who trade precious metals and other commodities for a living. 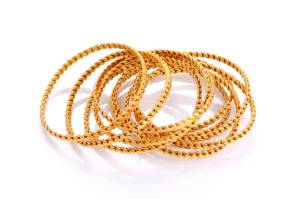 The purity of the metal within a piece of gold or silver jewelry is typically measured in karats. Maximum purity is measured at 24 karats, so the intrinsic value of jewelry with that designation is close to the spot price of an identical weight of gold or silver. For instance, a 24K necklace with four ounces of gold would be worth about as much as four ounces of gold on the open market. A 14K necklace would be worth about 58% as much. Although you might not ever get the chance to wear one, we figured you’d be curious about the street value of an Olympic medal. Depending on the price of gold and silver, a gold medal that contains six ounces of 24K gold and a larger quantity of silver could be worth anywhere from $500 to $800. A silver medal with no gold and a comparable quantity of silver is worth anywhere from $250 to $400. Regardless of what’s sitting in your jewelry box at home, it’s critical for you to have a firm grip on its value. After all, you never know when you’ll want to raise some extra cash by getting rid of an item that you don’t really need. At Premier Gold, Silver & Coins, we’re proud to offer competitive compensation for the gold and silver jewelry that we buy. Learn more about what we can do for you by visiting our convenient location, browsing our website, or filling out our online contact form.